After losing to the Houston Rockets Saturday night, the San Antonio Spurs found themselves in the No. 8 seed of the Western Conference and in need of a big win. They could not afford to lose if they were going to have any reasonable hope of moving up a position or two. But that would mean beating the Boston Celtics on their home court. Luckily, the Celtics are not playing very well right now. Boston got Gordon Hayward and Aron Baynes back from different injuries but were still without Al Horford. Jayson Tatum and Robert Williams III were also sidelined. So, the Celtics were still undermanned due to injuries, but that wasn’t their worst problem. They had no answer for LaMarcus Aldridge. The Spurs veteran center dominated the game scoring 48 points and pulling down 13 rebounds to lead San Antonio to an easy win, 115-96. Aldridge made eight of his first 12 shots and had 19 points in the first quarter. He went on to hit 20 of 31 shots including his only attempt from behind the arc. His 48 points sets a new single-game high for him on the road. But the game didn’t get off to an entirely bad start for the Celtics despite Aldridge’s first quarter explosion. It was a competitive game until the last few minutes of the first. That was when the Spurs went on a 13-6 run to take a seven-point lead, 31-24, heading into the second. It went a little better for Boston in the second, but the Spurs still led by seven heading into halftime, 54-47. The game didn’t start getting out of hand until the Spurs went on a 13-2 run late in the third that pushed the lead out to 15-points, 77-62. Boston was able to close the gap a little going into the fourth, but the Spurs were still up by 12, 84-72. While the game was within reach, the Celtics didn’t play like a team interested in making a comeback. The lead quickly grew to 16-points in the fourth and got as high as 25-points. 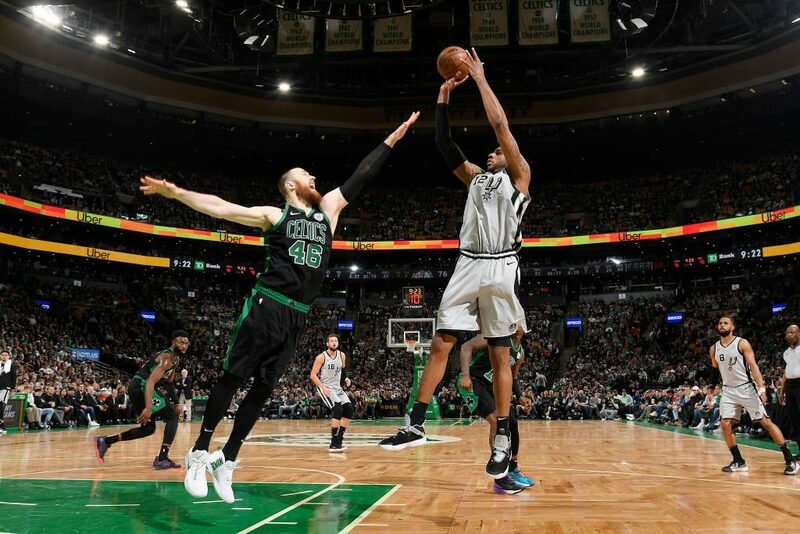 A three-pointer by Guerschon Yabusele closed out the scoring in the game and made the final, 115-96 in favor of the Spurs. Marcus Smart led the way for the Celtics with just 14 points. Marcus Morris and Gordon Hayward each had 13 and Kyrie Irving pitched in 11. The loss is Boston’s fourth in a row and moves them two games back of the Indiana Pacers (who dominated the Denver Nuggets Sunday night) for the No. 4 seed. But they do have two games remaining with the Pacers. Up next will be a trip to Cleveland to face the Cavaliers Tuesday night. With the Thunder and Jazz idle Sunday night, the win only moves the Spurs to within a half-game of both for the No. 6 or 7 seed. But of the eight games they have left, the Spurs face just one playoff-bound team. Next up will be a trip to Charlotte to face the Hornets Tuesday night.